A season for fun, romance and relaxation, summer is the perfect time for ladies to flaunt their hair. A fun-filled time of the year, most ladies are eager to spend as much time in the sun as possible, meaning finding quick and easy hairstyles is essential. Here are five chic and easy hairstyles, which will allow ladies to look fab no matter where they plan on spending those sun-kissed, summer days. Women with thick, lush hair will find that a low ponytail is a winning summer style for them. Using a brush or comb, ladies should scrape back hair and tie into a loose ponytail. Instead of using a bobble, ladies can spice up this style by taking a small section of hair and wrapping it around the remainder of hair. Tuck under untidy strands and use a small, bobby pin to secure if needed. Allow a few wisps of hair to hang loose around the face, in order to create a chic summer look. Ladies who simply don’t have time to spend hours on their hair in the morning will find that a few flowery accessories will go a long, long way. Those wanting a beautiful, summery look can have it in minutes thanks to the world of accessories. For a stunning style, pin back a small section of hair at either the left or right hand side, using a large, dramatic flower clip. 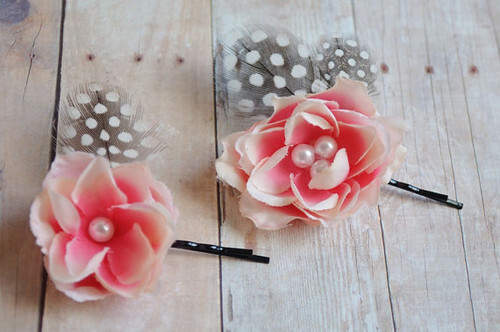 Alternatively for a sweet summer appeal, pin back both sides of hair using smaller, flower clips. An easy way to get into the spirit of the season, flower accessories are a great, must-have purchase. Great for all occasions, flower accessories are a fantastic buy. For that romantic meal in front of the summer sun, this hairstyle is a must. Easy to achieve, simply pull back hair into a tight bobble and then neatly twirl those gorgeous locks around it. Secure with another band and use bobby clips to pin back and tuck away loose strands. Mist over with hairspray to ensure locks stay in place throughout the evening. A look which can be achieved in less than five minutes, a tight bun is a classic, timeless style which will make ladies feel like royalty all night long. Ladies who plan to spend their summer days lazing about on the sands in front of the ocean will find that beautiful, beach waves make for the ideal hairstyle. Women with naturally curly hair should simply tame using mousse, working it through from roots to ends. Ladies with straight hair need not fear as this look is still easily achievable. Use iron curlers to create loose curls and then secure using mousse. A fab, summer look, beach waves are great for ladies with long and short hair alike. Wavy, beach hair makes for a great summer look. A messy braid is the perfect look for those laid back summer days. To achieve this fantastic do begin by creating a side parting in either the right or left side of hair. Next, sweep hair over shoulders and gather together. Divide into three sections and cross alternatively to form a loose braid. 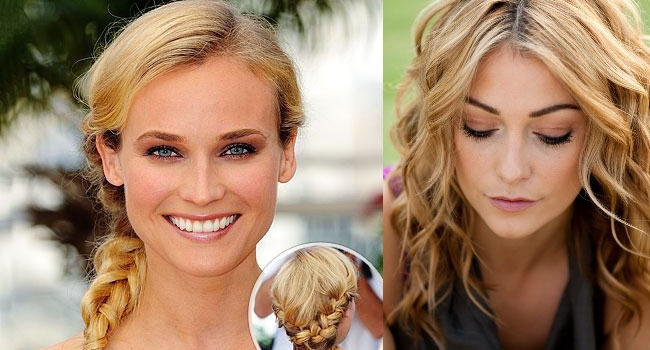 Secure with a bobble and then tug and pull at the braid to create a messy, chic look. A casual, cool style, a messy braid is a great look to wear alongside any sleek summer dress, use a product like Kerastraight shampoo for the maximum effect. Ladies looking for easy and chic hairstyles this summer will find these five styles a great place to start. From rocking messy beach waves to a truly timeless tight bun, there are a variety of styles perfect for every occasion. Those wanting to look fab this summer are bound to turn heads with these gorgeous hairdos.